This home is right on the beach in Moclips, Washington. It has unsurpassed ocean views from every room. Large deck on the ocean side with hot tub. All homes do require the first night plus tax for deposit. This deposit is non-refundable. If you cancel, this deposit IS NOT returned. There is a 2 night minimum stay, 3 nights during the holidays. All homes have a cleaning fee.You must be at least 25 yrs. old to rent one of our properties. Smoking is strictly prohibited. 6 PEOPLE MAX INCLUDING CHILDREN AND INFANTS AND 'NO MOTOR HOMES OR TENTS'. ANIMALS BESIDES DOGS ARE STRICTLY PROHIBITED. Maximum of 2 dogs, 70 pounds or less, crate sleeper, potty trained and no puppies. A pet fee in the amount of $25 per dog per night plus the 11.8% the pet fee is due at check in and is not included in airbnb fees. Pets are not allowed on the furniture or beds. Guests are responsible for their pets' behavior and for any damage caused by the pet. AT NO TIME MAY PETS BE LEFT UNATTENDED in a home or on the grounds of the home. When outside PETS MUST BE ON A LEASH AT ALL TIMES AND PLEASE CLEAN UP AFTER THEM. Sleeps 6. 2 Bedrooms / 1 Bath Two bedrooms have queen beds, and 1 hide-a-bed Full Kitchen TV / VCR/DVD Washer / Dryer Gas Fireplace Hot Tub WIFI, 6 PEOPLE MAX INCLUDING CHILDREN AND INFANTS, 'NO MOTOR HOMES OR TENTS'. Very friendly and accommodating. I was pleased with the quick responses and their aiding in my booking needs. We had a lovely time at Hazels place in Moclips! Beautiful location, cozy clean home. I would definitely go back! We liked your place so well, that I think we will book it again for next year. We have told our friends about it. You have a wonderful knack for making it "homey" and of course your decor reflecting the theme of the beach is outstanding.Let us know if you plan on replacing the hot tub. My wife and I were impressed by the cleanliness of the property. The kitchen was very well supplied. Thank. you for sharing your place with us. Oscar and Pat Jordan. Very friendly check in person with all the info we needed. She was a delight to work with. Hazel's house is an awesome vacation spot. I've been staying there for years and it only gets better and more relaxing after every stay! I only had to work with the members when I checked in so I spoke with them a total of two minutes. But they were very friendly. 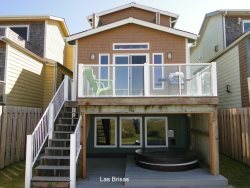 I loved that this property was right on the beach and away from any major towns. It was relaxing and perfect for a lazy weekend away. I plan to stay again in the future. Rick was very responsive to the questions that I had and he allowed us an early check in! The gal working in the check in office was friendly and the process was quick. We loved being so close to the beach. Having our morning coffee from the porch overlooking the rolling waves was unbeatable. The house was quaint, tidy and had all of the amenities that we needed. Perfect for a weekend getaway. We will stay again! Everything is JUST wonderful!!! Thank you very much!!! It was perfect. I'll be looking for availability in the near future. Property was exactly what we needed. All of the notes made expectations of us as guests very clear and easy to follow. No disruptions or interruptions during our stay. It was perfectly quiet and relaxed, exactly what was needed! We look forward to visiting again in the future, thank you! Team was friendly and accommodating. I will definitely be booking this property in the future. Relaxing atmosphere and great location. Beds were comfortable and kitchen stocked with everything you'd need. We found [email protected], around 16 years ago and have rented from them every time we go. They are always so helpful and go out of their way to help you! The properties are always clean and well kept! They always have everything we need! The staff is always so wonderful to work with every year. Thank you for always going above and beyond. We love coming back! we have rented houses from you several times ,the staff is always nice & courteous . we enjoyed our weekend and will stay at your houses again .